The Twin Cities will be the center of the sports universe in February, when Super Bowl 52 is played in Minneapolis. And while Mitchell Hamline is not often associated with big-time sports, three incoming students deepened our connection to that world this fall. One of our 1Ls is a former professional football player and star of a football reality show, another is a former top executive with the Seattle Seahawks and Supersonics as well as the Portland Trail Blazers, and one is a current Major League Baseball umpire. Each picked a different enrollment option—on-campus, Executive J.D., and HYBRID J.D. program—but their reasons for entering law school, and what they’d like to do after graduation, are all driven by their careers and experiences in sports. Jeremiah Allison endured a rigorous schedule as a linebacker for the Washington State Cougars. At 6 am he lifted weights. At 9 am he started classes. His afternoons were filled with team practice. His evenings were spent studying. As a full-time, on-campus student, Allison still starts each day by lifting weights. After that, law school fills his day. “Basically, I took my football work ethic and applied it to my law school work ethic,” Allison says. Allison’s road from college football to Mitchell Hamline wasn’t a straight line. 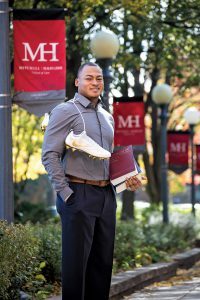 After graduating in 2016 with degrees in political science and criminal justice, he was thought by many sports watchers to be NFL-bound. Allison didn’t end up being drafted, an experience that was chronicled in the NFL Network reality show “Undrafted.” Allison took it in stride, saying the NFL stands for “not for long.” Law school was always the end game. After a stint as a legislative intern at the Washington State Capitol in Olympia, he did get some professional football experience outside of the U.S. Allison signed on to play one season with the Milano Rhinos, an American-style football team in Italy. After returning to the United States, Allison attended the CLEO Pre-Law Summer Institute at Mitchell Hamline. The goal of the month-long institute, held every year at a different law school around the country, is to give a diverse group of students a rigorous preview of law school. Its goal is to diversify the pool of potential law students in the U.S. and ultimately the legal world as well. Soon after, Allison accepted an offer to attend Mitchell Hamline. “You get a great feel here,” he says. Born in Minneapolis—where his dad still lives—Allison says going to law school in St. Paul feels like a homecoming. And studying the law has been something he has wanted to do since he was 10. After graduation, Allison hopes to continue his work in the sports world as an attorney for professional athletes. Don’t expect him to limit himself to just one path though. Whitsitt’s career began with an internship with the Indiana Pacers in 1978. Within a few years, he was named vice president of marketing for the Kansas City Kings, overseeing the team’s 1984 move to Sacramento. In 1986, when he was just 30, Whitsitt was tapped to become president and general manager of the Seattle Supersonics, making him the youngest top executive in the NBA. At the time, the team had one of the worst records in basketball and was last in the league in terms of attendance. When he left eight years later, the Sonics were a winning team playing in front of sold-out crowds, a feat that earned him the NBA’s 1994 Executive of the Year honor. Whitsitt had similar successes in top positions with the Portland Trail Blazers and Seattle Seahawks in the decade following. 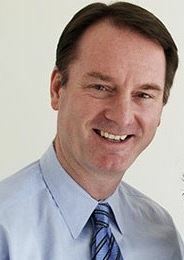 Since 2005, Whitsitt has served as the president of several companies and started a business consulting firm with his wife, Jan Sundberg Whitsitt. Whitsitt’s rise through the ranks of professional sports management left little time for something he always wanted to do—get his J.D. The 61-year old considered entering a part-time program at a law school in the Seattle area, but his hectic travel schedule doesn’t allow for on-campus classes, even at night or on the weekends. Here’s what did work for Whitsitt: the new Executive J.D., an enrollment option that lets professionals go to law school without upending their lives. Most of the coursework is done online with two intense, work-filled visits to campus each semester. Whitsitt comes to the program with plenty of business experience, something he hopes will come in handy as he studies the law. What’s next for the Whitsitt once he earns his J.D. from Mitchell Hamline? He says he might use his decades of management experience to help a new generation of business people. 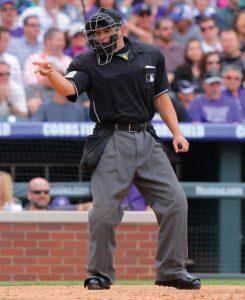 If there’s a job that perfectly prepares someone for law school and a legal career, it might be being a Major League Baseball umpire. Just ask Clint Fagan, an ump with 13 years of experience in more than 500 major league and 2,500 minor league games. YouTube is full of examples of Fagan keeping his cool in crazy situations—whether that’s standing nose-to-nose with a screaming player, trying to intervene in a bench-clearing brawl, or taking a deflected pitch straight to the facemask. A student in the HYBRID J.D. program, Fagan sees similarities between umping and the work lawyers and judges do. Fagan, 35, lives with his wife, Samantha, and their children, Addison and Hudson, in the Houston suburb of Tomball, Texas. He’s an insurance agent during the baseball off-season. He calls the online and on-campus HYBRID J.D. program a “perfect fit” for his career, one that’s filled with travel to ballparks around the nation, often on short notice. While Fagan hasn’t decided what he’ll do when he earns his J.D., he’s considering working toward—what else—a Certificate in Conflict Resolution from Mitchell Hamline’s nationally ranked Dispute Resolution Institute. Fagan is also looking at a future in sports labor negotiations. He’s held leadership positions with the minor league umpires’ union, where he’s helped negotiate contracts and resolve disputes. But he’s also considering real estate law. He’s learned a lot about that field from one of his mentors, Dan Bellino, who Fagan says is the only major league umpire who is also a practicing attorney. At least until Fagan graduates in four years.